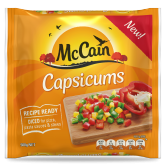 1 cup of McCain Diced Capsicums - cooked as per packet instructions. 1. Bring a large pot of salted water to the boil, add pasta, cook until al dente and drain. 2. Reduce heat to low, add tuna and garlic to the pot and using a fork, flake the tuna. 3. Add McCain Diced Capsicums, pasta, lemon juice, lemon zest, Kalamata olives and rocket. Toss to combine and season with salt and pepper to taste. 4. Divide pasta evenly among bowls, top with each bowl with 1 tsp of basil pesto and serve. 5. 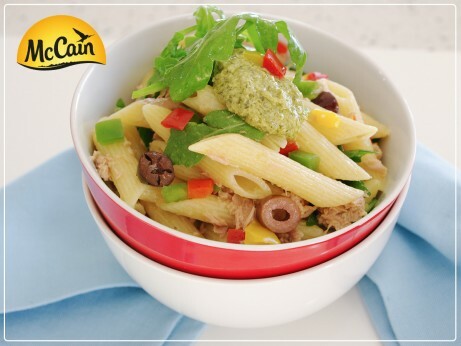 TIP: this pasta is delicious cold and leftovers make a great lunchbox addition for school, work or picnics! 1 Bring a large pot of salted water to the boil, add pasta, cook until al dente and drain. 2 Reduce heat to low, add tuna and garlic to the pot and using a fork, flake the tuna. 3 Add McCain Diced Capsicums, pasta, lemon juice, lemon zest, Kalamata olives and rocket. Toss to combine and season with salt and pepper to taste. 4 Divide pasta evenly among bowls, top with each bowl with 1 tsp of basil pesto and serve. 5 TIP: this pasta is delicious cold and leftovers make a great lunchbox addition for school, work or picnics!